Roland S. Martin says few have understood how much power is wielded by Obama adviser Valerie Jarrett. (CNN) -- Five days after the 2008 presidential election, Steve Kroft of "60 Minutes" did a profile on "Obama's brain trust," four political veterans that he reported were the president-elect's most important team members: David Plouffe, Robert Gibbs, David Axelrod and Anita Dunn. When the report aired, I immediately asked myself, "Where's Valerie?" -- as in Valerie Jarrett, clearly the most important adviser to the president. After calling around, I discovered that Jarrett didn't even know about the sit-down interview. As Arsenio Hall used to say on his show, "Things that make you go, 'Hmmm.' "
But after reading the New York Times Magazine cover story on the 52-year-old Jarrett, a longtime Chicago, Illinois, business executive, it's safe to say that that mistake will never happen again. Washington is all about power and the approximation to power. Who is in and who is out is the favorite parlor game among the elites, and the wide assumption by many was that when it came to whom the president relied on the most for advice and counsel, it would have been chief of staff Rahm Emanuel, senior adviser Axelrod and press secretary Robert Gibbs. Yet I'll be willing to bet you a few bucks that after the Times piece hit the streets, Washington power players were picking up the phone and trying desperately to get on Jarrett's calendar. And for those who mistook her as nothing more than a Chicago hack benefiting from a great friendship, they are trying to figure out how to get in her good graces. In the course of 8,100 words, writer Robert Draper made it clear that by her long association with President Obama and his wife, Michelle, no one in the White House knows them better than Jarrett, and that their longtime confidant and mentor is unmistakably the one voice, other than his wife, that the president relies on. "Over time, I think our relationship evolved to the point where she's like a sibling to me. ... I trust her completely," he told Draper. Yet what was also interesting about Draper's article was the jealous nature of the men around the president. Now, I'm sure they will be quick to say that Draper focused on the negative aspect of their comments and not their effusive praise of Jarrett, but a read of the article makes it plain that there is friction there, which is nothing new in the White House. Axelrod came off as dismissive of Jarrett's contributions by asserting that she has best served on dealing with "family issues." In fact, there has been lingering resentment among some in the campaign going back to when Axelrod told a reporter with The Wall Street Journal that Jarrett was helpful to the campaign, namely with handling black media. I recall several officials inside and outside the campaign ticked off at the statement. Draper writes that Emanuel was none too happy when discovering that Jarrett discussed office space with Bush's chief of staff, Joshua Bolten, and actually confronted her. Emanuel called it a "misunderstanding," but again, in Washington, power is often seen based on office size and proximity to the president, and it must drive the chief of staff nuts to know that his voice isn't the last one the president relies on. Plouffe, who ran the president's campaign, clearly is shown as not caring for Jarrett, telling Draper "she wasn't terribly involved in strategic issues." That's pretty funny considering she was knee-deep in the direction of the campaign. But she wasn't at all greeted warmly by the officials at the top of the campaign. If anyone says the two got along well in the campaign, trust me, they are lying. I'm sure the three of these gents are now asking themselves, "What does the president think about the article?" The last thing they want to do is to have the boss sense their dismissal of his most trusted adviser. Frankly, it's smart for Obama -- or any politician -- to have someone as close as Jarrett by your side. All too often in life, and especially politics, influential people have a group of "yes men and women" who aren't willing to challenge them to make the best decisions. As the article illustrates -- and I know of other instances -- where the candidate wanted to go one way, those close to him, unwilling to risk the wrath of Obama, capitulated. But on those occasions, Jarrett saw things differently, and because of her total and complete understanding of the candidate, he agreed to follow her instruction. Finally, it's worth noting that Jarrett's gender and race is also important to this equation. Her presence means that it's no longer about "All the President's Men" being a group of smart white guys. She brings her experiences as a woman, an African-American woman, a businesswoman, to the table, and she doesn't see the world through the prism of a white male. Our ethnicity and gender play a role in how we make decisions, whether we want to admit it or not. And it's high time that we have greater diversity among the upper echelon of a president's advisers. 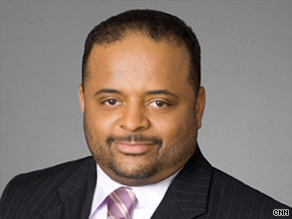 The opinions expressed in this commentary are solely those of Roland S. Martin.